If words fail to define the richness and contentment lent by a genre of music, we are most likely talking about jazz. There’s a comforting warmth to the lasting impression and the profound experience that is jazz. There’s no earthly way of describing the flush tones that tell of the individual signatures of the likes of Miles Davis, Cecil Taylor, the Satchmo, and Ella Fitzgerald. Such ethereal music demands audio gear that can respond to the urgency of its airy impact. While speakers best speak the language of brass and woodwind instruments, headphones provide a more intimate experience, just like the nature of jazz music. So we scoured the market for the 10 best headphones for jazz. These are spread out through the price spectrum and feature list. What makes a headphone perfect for jazz music? There’s a clear demarcation of how hip hop headphones, classical headphones, pop headphones, rock headphones et al need to be. The jazz headphones are more of an emotional choice. You need to feel the jazz music at its enigmatic and lush best. The way the mids, bass and highs are pronounced in jazz songs are best experienced than heard. We will try to correctly describe the feeling that makes a headphone worthy of jazz. Texture: Listen to John Coltrane or Charlie Parker and you are immediately reminded of honey glazing over a smooth surface. The texture of honey is simultaneously decadently thick and freshly agile. There’s a smooth quality to the way music flows without any hitches. The transition between notes should be effortless but should have some weight to it unlike classical headphone. In the latter types of cans, the audio is fast-paced but does not have the character that jazz requires. Audio Signature: Instead of the surgically accurate headphones that flatter classical headphones, you need a little warmth to listen to jazz. The jazz audio runs on rich smooth velvety mids that reflect every detail of the music. The sax, the raw vocals, piano, trombone, clarinet and rest of the beautiful jazz instruments should shine through the layered quality of mids. Jazz goes bold with the bass using double bass and drums. To bring the warmth, the bass of the headphones should be fast and meaty. There’s no room for light or bloated bass. The complexity of jazz music demands that the bass response is fast. The highs should be detailed and defined. But any amount of sibilance will ruin the jazz experience. Airy: Jazz uses a lot of woodwind instruments. The movement of air through the recording helps shape that elite character of jazz. This creates a sense of space between the instruments so that you can tell one sound from the other. Air should also enter the multiple layers of details in the midrange to give it a sense of clarity. Intimacy: Jazz has a certain sensual appeal that comes from the intimate placing of the music. That’s why closed bars made the perfect place for playing jazz. There are so many emotions that you require an intimate soundstage to feel like a participant in the jazz experience. Type: There’s a choice between open-back and closed-back headphones to play your favorite jazz tracks. Open-back headphones have a larger soundstage and sound more airy. But there are closed-back headphones that can rival that soundstage and also preferable for daily use. User preference: Although the instruments and the definition of jazz music is same across the artists, each artist adds her/his own essence into the music. Just as every listener adds their perception over the music. Since jazz is a subjective genre, the kind of headphones that appeal to you depends heavily on your tastes of audio response. What other genres can these jazz headphones be used for? While jazz headphones have a unique footprint, they can play some other genres just as well. Blues, the despondent cousin of jazz, is full of the hushed emotions that jazz portrays. It’s just as nuanced but it has a dark forlorn undercurrent. It balances improvisation and precision just like jazz. Blues also benefit from the thick, layered mids that complement jazz music. It can work with punchy bass and controlled highs. The best headphones for jazz usually sound excellent with blues music as well since the core characteristics are the same. 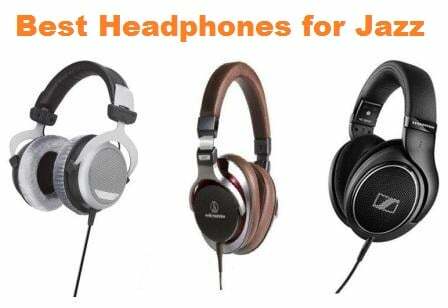 Jazz headphones are usually preferred by classical music-aficionados as well. They have a focus on the midrange which brings the classical instruments to the limelight. Headphones for jazz also tend to have a neutral sound signature that’s a pre-requisite for classical. The actual classical headphones might sound a little more surgically neutral though. Such clinical balance may kill the vibe of jazz music. What are the key features of high quality headphones for jazz? Audio: We first checked out the audio signatures of a bunch of headphones to figure out which ones will do justice to jazz. We looked for the thick yet agile texture in mids, the e punchiness of bass, the control of treble and the intimacy of the audio. Comfort: If you are a jazz enthusiast, you probably spend a lot of time with the headphones on. We wanted the best headphones for jazz to be comfortable for continuous wear. The over-ear and on-ear headphones selected here have been voted wearable for long periods of time. Design: We selected both open-back and closed back headphones. The former are good for listening in a quiet space but not all of us have that luxury all the time. The best jazz closed-back headphones bring the required airiness while providing the intimacy we want to hear from the jazz instruments. 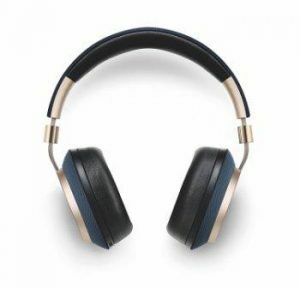 Features: These are the best headphones for jazz because they also bring other features to the table like foldability, detachable cable, handy pouches etc. Budget: Our picks for the best headphones are spread across a wide budget. We compared headphones of different price-tags based on the value for money. Whatever your budget, we want you to get maximum value for it. the genre. These cans debuted more than a decade ago as Sennheiser’s flagship headphones and they have never been taken off that pedestal by the audiophiles. The HD650 can handle classical, jazz and blues with the same panache as rock music. Being an older design, it lacks some of the more recent features. The clunky retro-architecture apart, these qualify in every way as the best headphones for jazz. The Sennheiser HD650 are classic headphones for jazz. The pencil-gray design has certain nostalgic charm. But these cans were still ahead of their time considering the modularity. The ear pieces are large and oval-shaped. They are extremely comfortable, so much so that you can wear them for extended studio sessions with no physical fatigue. The oval shape sits outside the edges of your ears. They are topped with plush earpads and velour padding, both of which are quite easy on ears. The headband is broad to offset the 9-ounce weight of the headphones. It has thick padding along the arch to support it against the head. The ear pieces can swivel forward from their mounts to adapt to the shape of your ears. Except little or no isolation from these ear pieces as HD650 promote free flow of air. The construction is entirely high-grade plastic. The 9-foot cable of these jazz headphones is detachable. Consider than feature in a 16-year old model and you know why HD650 found such favor in the market. The cable plugs in on both sides. But since it’s replaceable and the HD650 is such a popular model, we are satisfied with the cord. There’s a 6.3mm to 3.5mm adapter cord in the package. Sennheiser doesn’t pack a carrying case because the HD650 is clearly not meant for portable use. Under the hood, aluminum voice coils produce the fast yet rich audio that flatters jazz music. The drivers are manually matches to get you maximum precision. These Sennheiser headphones have a smooth size-adjusting mechanism that allows you to adjust it to any head size and shape. The Sennheiser HD650 jazz headphones are actually all-rounders in terms of audio. They play every genre with prodigious skill. But why the zing with jazz is because their texture has that sweetness that jazz needs. The transition of notes during improvisation are deftly handled by HD650. It is light on its feet, so the complex mixes are easily resolved into clear notes. As we expected from the top headphones for jazz, these have a luscious midrange. It is thick with detailing and instrument placement. The mids flow unhindered by bass bleed. The mids are flat but slightly forward. The bass has just enough oomph to play jazz but not so much that classical will sound funny on these headphones. 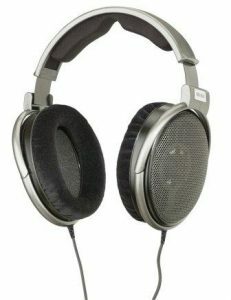 It might not have the sub-bass punch of certain newer reference-quality headphones but it performs well for our needs. The treble has excellent definition but a slight lean toward the lower treble. This brings more control in the highest frequencies and keeps it from sounding too bright. Due to the open back, the soundstage is quite spacious bit locates inside the head for an intimate performance. These jazz headphones have some of the lowest harmonic distortion we have ever heard in monitoring cans. So the performance stays consistent throughout the volume range. most affordable high-definition cans. They bring forward an amazing amount of detail which requires good quality source material. It is primed for the changing volume of the jazz music. These are closed-back headphones so you can use them for your day-to-day music listening. The attractive design, the compact form and A-T trademark robust build quality, all earn it a top place in the best headphones for jazz list. 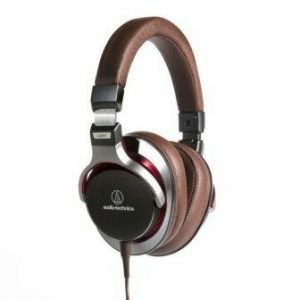 The Audio-Technica MSR7 Sonic Pro headphones have the cool upbeat design that will appeal to mature and young audience alike. There something grounded in the bold curves, precise stitching, metal headband and the metallic highlights. The earcups are racetrack oval with soft and lavish padding. The back of the ear pieces has some metallic highlight which also lend additional sturdiness to the structure. The headband is only moderately broad but very well-padded from ear to ear. The ear pieces can lean forward from their mounts for a good fitment. The robust build quality of these jazz headphones rakes up a weight of 10.2 ounces. The headphones compensate with average clamp pressure. If you have a big head, you might want to stretch these headphones on a pillow for a couple of days. The pressure adjusts to your size soon. The MSR7 jazz headphones come with three detachable cables. Bothe sides of these cables have 3.5mm connectors so it’s easy to find replacement. There are two straight audio cables of 4 feet and 10 feet and a third cable with inline mic. Two of them end in L-shaped plugs. Even the plugs have metal housing which ensures they don’t get trampled by your feet. The earcups of these headphones fold flat. So they can be easily stowed inside the vinyl bag that accompanies them. At 37 Ohm impedance, they can be driven directly from smartphones and portable mp3 players. First off, since the Audio-Technica MSR7 jazz headphones are high-fidelity and require a good source. Otherwise they will lay bare the imperfections of your MP3 files. A good amplifier will help get the best sound out of them. Of course the intricacies are apparent to trained ears and not so much to casual listeners. The audio of MSR7 offers startling clarity, the kind that can handle energetic jazz compositions. The midrange sounds more realistic on MSR7 compared to headphones in the same price range. The piano and strings have a richness of tone. Although the famous M50x cans from S-T are touted as professional monitors, they are a bit boosted in the bass department. In comparison, the MSR7 jazz headphones have punchy but tight bass. There is no extra warmth added to the sound, the meatiness of mids satisfies the jazzhead. The treble is bright and crisp with no hint of sibilance. The soundstage is huge for a closed-back headphone. It gives plenty of space for image separation. The stereo image is an in-the-head experience just as jazz should be. The Sennheiser HD598 headphones make a lasting impression, especially the ivory model with burl wood accents. Its not looks alone that capture the imagination of the users, its ultraclean audio in its presentation. The way the midrange shine, these are perfect for jazz. But the clarity also aids the playback of classical music. Much like HD650, these are all-rounder headphones. They offer similar comfort and the openness that open-back headphones bring. These are a no-brainer for the best headphones for jazz list. The Sennheiser HD598 jazz headphones in their ivory glory stand out from the crowd. There’s a black version and a closed back version too. But nothing draws you closer like the ivory version. These headphones have oval earcups with open metal grille at the back. They are opulently padded and topped with velour coating. The headband is padded at the arch and sheathed in genuine leather. There are burl wood accents around the grille which are there for only decorative our purposes. The clamp pressure is minimal and the HD598 hardly slips from the head. These jazz headphones weigh 9.5 ounces. 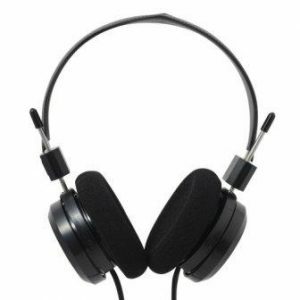 These are comfortable for long hours of music playback even in the studio environment. The drivers are positioned to aim the audio right inside your ears, a technology that’s used in Sennheiser’s most high–end headphones. The construction is completely plastic but exceptionally strong. The HD598 comes with a detachable cable. This 3m cord has a 2.5mm jack to connect to one earcup. This is secured by the twist-and-lock mechanism, so it doesn’t yank off the ears when you jerk away suddenly. 2.5mm-6.3mm cables arealso relatively easy to replace. They are accompanied by a 6.3mm-3.5mm adapter for connecting to portable devices. At 50Ohm, these can be driven by smartphones. These are not meant to be portable so they don’t come with a carrying case. Sennheiser HD598 jazz headphones walk a balance between detailing and character. The audio is quite clean but not surgically so. The bass has a tight and meaty presence. It extends well into the subbass region, so you hear the appropriate amount of bass even when the volume is lowered. The extension of bass ensures that your audio remains energetic and fun. The midrange has the clarity of higher ends Sennheiser headphones. The dynamic quality of vocals and midrange instruments is precisely why these are one of the best headphones for jazz. The treble of these jazz headphones is keeping with the accurate sound signature. The soundstage is massive and the listening experience embraces you from outside rather than being restricted to your head. They respond well to amplifier and DAC and benefit from the quality of sources. digging and found that the DT880 250Ohm version is the best-suited one for the jazzheads. These semi-open cans bring you the best of closed-back and open-back headphones. They have a very comfortable design which comes with some high-end accessories. These premium cans get a rightful place in the best headphones for jazz list. The Beyerdynamic DT880 Premium 250Ohms headphones present a handsome package. They are part metal, part plastic and completely awesome design-wise. The ear pieces are topped with an aluminum backplate. These are large round structures with lavish padding. The earpads are sheathed in velour. These have been rated as some of the most comfortable cans in this price range. The headband is broad with optimal padding from ear to ear. The black and silver color tones are well-chosen. The earpads can be replaced when they wear out. The cable of these jazz headphones are permanently attached to a single side. The cord is 9.5 foot long in the interest of connecting to audiophile gear. This terminates in a 3.5mm plug with a 6.3mm jack provided. They also ship a 15-foot extension cable with a 6.3mm plug. A sturdy aluminum case accompanies these headphones. The Pro version of the same model is better for studio use with a tighter clamp and coiled cable. Premium are more comfortable for the home studios and individual enthusiasts. The Beyerdynamic DT880 Premium jazz headphones hit the nail on the head with instrument timbre. They have a dark, luscious quality about it that even HD650s struggle with. These are tonally balanced headphones. The semi-open design keeps your music from leaking out. But they are still porous to the ambient noise. The midrange has an excellent texture that’s made for the jazz genre. It has the honey-like gait and clarity. It is supported by a strong but controlled bass. The lower frequencies enter well into the sub bass region which brings more body to the mids. The treble is sparkly without being too bright or overbearing. The soundstage is wide but relatively more intimate compared to the true open-back headphones. These are jazz cans which might not appeal to a purist like the AKG K701 will. They are reference quality without killing all the fun. Because of the high impedance, these cannot be driven by a portable source, but they perform well with a good portable amp and DAC. audio response of HD600 to HD598 as it’s more neutral. But for jazz, HD598 wins by a slim margin because of the thicker midrange playback. Although these are 1.5 decades old headphones, they offer detachable cables and exceptional comfort. These classic Sennheisers deserve their own place in the best headphones for jazz list. The Sennheiser HD600 headphones are cosmetically similar to the HD598 headphones, except for the unabashedly plastic makeup. The ear pieces are long oval that sit completely outside the perimeter of your ears. These are topped with plush padding and are sheathed in velour. This material provides both a comfortable fitment to the ears and better breathability compared to leather earpads. The back of the ear pieces are completely covered in metallic grille. The headband is broad and lined by thick padding throughout the arch. As with all Sennheiser headphones on this list, these are comfortable for large periods of continuous use. They can take the abuse of studio use while you monitor audio for hours on end. That being said, they are dorky-looking so we would restrict them to home use. These jazz headphones have a detachable 9-foot cable that ends in a 3.5mm jack. The cable is Kevlar-reinforced against any damage. But the option to replace it is highly appreciated. They come with an adapter of 3.5mm-6.3mm. These are rated at 300 Ohm impedance. But surprisingly these can be driven by portable smartphones with a good volume range. Given their audio quality with lightweight aluminum coils, they are best driven by good source equipment. Another perk of these Sennheiser headphones is that their earpads are user-replaceable. So when the velour scrubs smooth, you can go for a different pair. 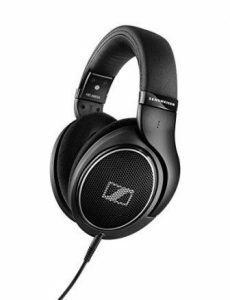 The Sennheiser HD600 jazz headphones are a great all-round headphones. They can play every light genre with considerable depth. Since these are neutral headphones, they are slightly less warm than the HD598. On the other hand, you hear more details from HD600 due to its precision. The bass is punchy and controlled here. It does not bleed into the mids. The bass content of HD600 does not extend into sub- bass as much as the HD598. It could also be a consequence of the highly open design which reduces the bass effect. But HD600 is still an excellent pick for jazz music. The midrange of HD600 headphones is surreal in its detailing. The performance of these cans in mids is as high-end as it gets in headphones. Detailed, dynamic and airy, these mids handle the vocals and instrument well. The treble is reined in to control sibilance. But it has good detailing throughout. The soundstage is large as expected from open-back headphones. These headphones are more revealing than the HD650 but not quite as warm. combination is impossible to find. 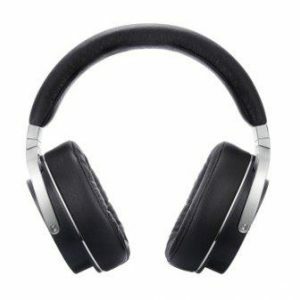 Planar magnetic headphones are known for their extremely low distortion and high integrity of audio. Finally, we have a contender that we can use on the move. These are also one tough set of cans with metal construction. They were a lock for the best headphones for jazz list, the moment we laid eyes on their specs. The Oppo PM3 jazz headphones look magnificently minimalistic. The milled arms than hold titanium earcups speak on sophistication in every curve. The ear pieces are large racetrack oval. But they don’t stick out of the ears. Being closed-back, they back is protected by earplates. They are plushly padded and sheathed in the finest leather. The ear pieces swivel forward to meet your ears at the right point. The earcups fold flat for storage. The headband is wide and padded well. They feel solid and comfortable on the head. At 11.3 ounces they are a little heavy though. These jazz headphones have a detachable cable that runs 9.8 feet long. The cord has an inline remote to male calls. It terminates in a 3.5mm plug and comes with a 6.3mm adapter. A soft zippered carry bag is also provided. Because of the sturdy constriction, you wouldn’t need much more to store it safely. Due to the high impedance, these are better driven from an amp. The Oppo PM3 headphones have a closed-back design which automatically isolates you from much of ambient noise. Nothing like solitude to enjoy Satchmo’s voice. These are warm and smooth, a combination we find extremely appealing for jazz. The warmth just plays into the sensual mood of jazz. They are smooth in the presentation of mids but extremely revealing. They will make a bad source sound worse. The midrange has excellent body which lends strength to instruments like piano and string instruments. The bass is slightly plumper than a flat headphone like K701 would allow. But that’s why PM3 is the fun-can. The treble is slightly tames in comparison to the presentation of neural headphones imparting a sweetness to the jazz sounds. The soundstage is massive for a closed-back headphones. The detailing and instrument spacing on these cans make them perfect for classical as well. compared with AKG’s flagship Q701s. But jazz enthusiasts concede that the K701 headphones sound the best to them. These are open-back cans which bring ridiculously clear sound with as many details as the source can muster. They have the signature AKG design that belongs to the tedious hours put up in the studio. Along with a skill for classical music, these are one of the best headphones for jazz. These jazz headphones have a single-sided cable. It extends 10 feet and ends in a 6.3mm jack. A 3.5mm jack is supplied to be screwed on to this. At this price, we are disappointed that these don’t have detachable cable. If the cable goes bust, they will retire too for a simple electrical failure. The good news is that the earpads are replaceable. The build is all plastic but these are ultra-strong cans. 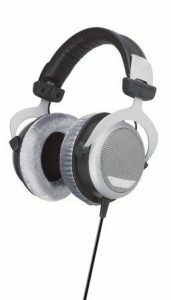 The AKG K701 jazz headphones are mid-focused right off the bat. Even after 60 hours of burn-in, the mids stand out. With jazz, we cannot complain. The mids are startlingly detailed with almost a surgical clarity. In comparison, the Sennheiser HD598 sound warmer and more enjoyable. But some of the jazzheads would like the combination of highly-resolved forward mids with a slightly recessed bass. The lower frequencies are tight, defined and agile. But they aren’t as balanced as the HD650s. The purist audiophile who also dabbles in classical would find the K701 exceptionally easy on ears. You can boost any part of the flat frequency with an equalizer. The treble sounds bright in these AKG jazz headphones as it usually happens with the ultra-clear headphones. The soundstage is pretty wide but not as deep. So some recordings might sound strange to trained ears. alternative to much more expensive dynamic headphones or the closed-back Oppo PM3. These are sturdy cans with exceptional clarity of sound. The precision of sound, exceptional detailing and enjoyable audio response all lead them into this best headphones for jazz list. The HiFiMan HE-400i jazz headphones have some real fancy touches in their design. These are suspension type headphones where the headband automatically adjusts to the size and shape of your head. It has a broad headband to distribute its 13.05 ounce weight. These descend into round earcups that sit around the ears. The backplate of the ear pieces have an open metal grille. The earcups are laden with soft padding with velour making contact with your ears. These are comfortable except for the fact that they may feel to heavy on a small head. The earcups fold flat for storage. These jazz headphones have a detachable Y-cable that runs 1.5 feet in length. It terminates in a 3.5mm plug and a 6.3mm adapter is provided with the pack. The cable is capable of taking some serious abuse. We are willing to et it pass that the cable is double-sided. These cans can be driven by a portable device unlike the Oppo PM3 which requires a powerful source. 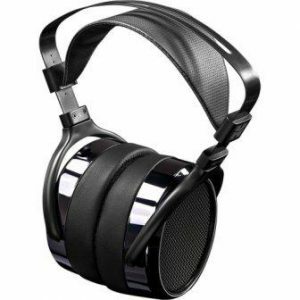 The HiFiMan HE-400i jazz headphones are easily beating dynamic headphones at their price. These go all guns out in terms of clarity of audio. The details bring you a sense of depth that you won’t see in dynamic headphones of this range. They are supported by solid bass that never bleeds into the midrange. The midrange has a focus which flatters the jazz instruments. But it’s also accompanied by a warmth of tone which we mentioned in the introduction. The bass is well-defined and supports the mids. Being open-back headphones, these sound expansive in their instrument presentation. With an amp plugged in, the audio shines even more. A good source brings a lot of difference to the performance of HE-400. At their reduced price, they bang big for the bucks. play the music with much emotion and detail. We expected these to be slightly uncomfortable because of their on-ear design. But Grado nails that too. The retro look hides some superior technology which makes these as good as professional monitoring headphones. These get a free ride to the best headphones for jazz list. Grado SR80e Prestige Series headphones have a very minimalistic design that’s geared for comfort. The earcups are small and round. The have a metal mesh at the back. These are topped with foam earpads that sit comfortably on the ears. They can give the over-ears a run for their comfort. The headband is a broad but very lightly padded arch. It is sheathed in leather and custom-stitched in contrast thread. Since the ear pieces are so lightweight, this headband handles the weight well. The cable of these jazz headphones is permanently attached to both the earcups. This is a thick cord that ends in a 3.5mm jack. A 6.3mm screw-on adapter has been supplied. Since these are audiophile headphones, there is no inline mic. The ear pieces fold flat for storage. The Grado SR0e have a sweet sound signature that mark them as perfect budget jazz headphones. They have a full and meaty bass which gives them a nice base for the clear mids. The bass is well-defined and tightly held. It does not bleed into the mids. The mid-range has intricate details that we didn’t expect to see at this price range. The improvisation of jazz is suddenly very visible and sweet to us through the SR80e. The treble is detailed and non-sibilant. Because of the full bass, the audio sounds substantial even at low volumes. The soundstage is very spacious due to the open-back device. These are good headphones for quiet environments. again is the sweetness of audio that melts your heart just as much as My Funny Valentine does. These are beefy but extremely durable headphones with all the modern doodads that make modern headphones portable and convenient. Wild horses couldn’t have kept them out of the best headphones for jazz list. The Bowers and Wilkins P7 jazz headphones set the threshold for headphone vanity. They look similar to the P5 cans but they are he bigger over-the-ear design. The earcups are rectangular in the tradition of P-series. The ear pads are thick, covered in leather and detachable. They are attached via magnetic snap. The part where the detachable cable plugs into the earcups is hidden below the earpads. This adds security o the connection and doesn’t come at the cost of convenience. The headband is also lavishly padded throughout the arch. The construction is plastic with metal reinforcements. These jazz headphones come with two detachable cables. One is audio only and the other carries an Apple-friendly inline remote. The earcups fold inwards for easy storage. They are supplied with a zippered carrying case. At 10.22 ounces, these are slightly heavy but sit easy on the head because of the excellent design. The B&W P7 headphones provide excellent noise isolation which lays down the foundation for a good audio response. They have a full-bodied sound that trumps the openness of open-back headphones. The P7 has a smooth midrange. It offers a lot of details but without being too judgmental over bad recordings. The mids have sweet texture that works well with the nature of bass. The bass is full and tight. It does not defy the mids but partners with the vocals and strings to give you a coherent response. The P7 headphones have an overall warmth that we went looking for when we first started searching the best headphones for jazz. For a closed-back headphones, they sound quite spacious too.